Shrubs that are 10 feet tall fill many needs in a garden. They can be stand-alone specimen plants, windbreaks, privacy hedges or the centerpiece of a flower garden. As shrubs need optimum conditions to reach their full growth potential, it's a good idea to pick one that grows taller than 10 feet and then prune as needed. Blackhaw viburnum (Viburnum prunifolium) is a member of the honeysuckle family. The shrub grows up to 15 feet tall and 10 feet wide with medium to dark-green, egg-shaped leaves that turn burgundy, red, orange, yellow, or purple in the fall. The small, white flowers appear in May growing in flat-topped clusters that measure 2 1/2 inches in diameter. The flowers stay for one or two weeks and are followed by green, yellow, and red-pink fruits from August through the early part of December–all of which turn a blue-black or blue-pink when they mature. You can plant blackhaw viburnum in full sun or full shade and in a soil that is well-drained. The plant is hardy from New York and Connecticut west through Minnesota, Iowa and Nebraska, south to the Gulf Coast of Texas and east to the Georgia coast. Black hawthorn (Crataegus douglasii) is a member of the rose family that grows to from 6 to 30 feet tall with red twigs and thick, oval leaves. The white flowers bloom in May and June, growing in clusters at the tips of the branches and giving way to blue-black berries. Plant black hawthorn in full sun, partial shade or full shade. The plant uses a high level of water and needs to be planted in a soil that is moist to wet. This shrub is hardy from Alaska, Alberta, British Columbia, Ontario and Saskatchewan, down the West Coast and then east through Nevada, Utah, Wyoming, Idaho, Montana, North Dakota, South Dakota, Wisconsin, Michigan and Minnesota. Butterflies and birds will stop by for the nectar and the berries. 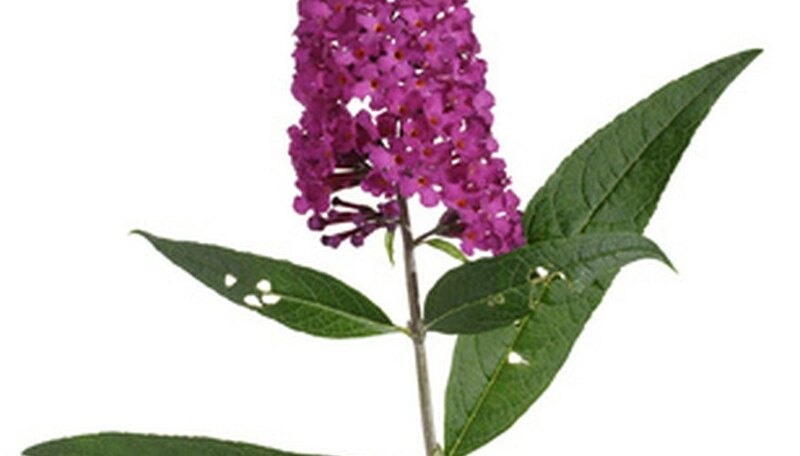 Butterfly bush (Buddleja davidii) is also known as buddleia and summer lilac. The plant grows from 6 to 12 feet tall with a spread of 4 to 15 feet. The gray-green, lance-shaped leaves are similar to that of the weeping willow that grow from 6 to 10 inches long. The fragrant, lavender-colored flowers grow in cone-shaped clusters that grow from 8 to 18 inches long. Plant the butterfly bush in full or partial sun and in a soil that is dry to slightly moist. The plant is hardy from the coast of Maine though southern New England, west to eastern Colorado, south to the Gulf Coast and southern Florida and up the West Coast through parts of California, Oregon and Washington.